3 double bedrooms.2 bathrooms.This property sleeps 6 people. The House of Storks is a thatched Polish-style country house luxuriously equipped to western standards, sleeping six. We have made the House available to guests through HomeAway for 10 years. The House of Storks offers 3 double bedrooms, 2 bathrooms, open plan downstairs, large garden with barbecue area and a wood fire hot tub – and a good WiFi connection. The House of Storks is in a small development outside the village of Bojano, with woods and fields around. It is in a rural and peaceful location. Essentials can be bought in the village (2km away) and major supermarkets are within easy reach by car. New roads provide easy access to the tri-city of Gdansk/Gdynia/Sopot (15-20 kms away)which offer great sight-seeing -particularly in the wonderful old town of Gdansk - fine restaurants, boat trips to the resort of Hel, and good shopping all at reasonable prices. The picturesque Kaszuby lake district is easily reached. Malborg castle is also well worth visiting. You can swim and wind-surf at Puck and Hel, and sun-bath and swim at the beach at Sopot. Flights: Ryanair - daily fights from London Stansted to Gdansk. Wizzair - daily flights from London Luton to Gdansk. You can also fly to Warsaw with British Airways, Easy Jet , and then take the train to Gdansk - or fly Warsaw to Gdansk with Lot Polish Airlines. My name is Anna and I am originally from Poland. I moved to England over 35 years ago where I now live with my husband John, my two daughters, and our cat Jerry. It was always my dream to have a base in Poland where all the family could gather and spend time together. 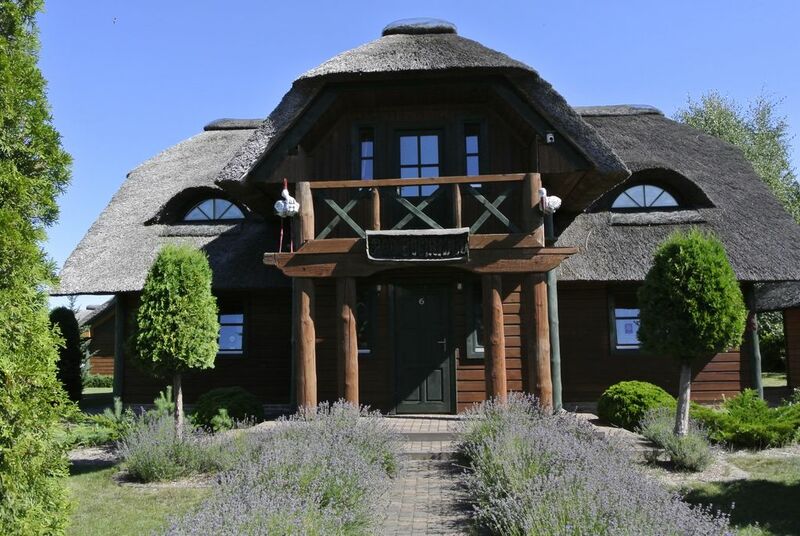 I am now so thrilled to have the House of Storks and Amber Farm (HomeAway.co.uk #57818) as tranquil havens in the beautiful Polish countryside for the enjoyment of family, friends and our guests. My brother and sister-in-law, Chris and Mirka, look after the house. They live next door to the House of Storks and are pleased to offer a warm welcome to our guests. They will show guests round the House, explain how everything works, and give guests the benefit of their local knowledge. One of Poland's features is its beautiful countryside and forests, and I always wanted my home to be part of the landscape. The House of Storks is built from local wood and thatched with reed farmed from Polish lakes. It is very comfortable - cool in summer (which can get very warm) and the thick walls and the log fire keep us warm in winter. The House of Storks is ideally placed to visit the tri-city (Gdansk, Gdynia and Sopot), the lakes of Pomerania, and local beaches. The wood burning hot tub in the garden is always a big hit with our guests on a summer or winter's evening. Modern, built to western standards, with gas central heating and wood burning fireplace. Open plan downstairs with wooden floors. Double doors leading to large garden. Separate WC downstairs. Upstairs 2 very large double bedrooms with double beds. Main bedroom has ensuite bathroom. 3rd bedroom has 2 single beds and door onto balcony. Furnishing in style with the house. The garden is shared with the house of the owner's brother who will welcome guests. Landscaped garden with patio around the house and separate BBQ area with wood burning hot tub. Fish pond at front - care should be taken with small children. Wooded and farmland countryside good for walks, bird-watching and cycling. Great for relaxing but near the city attractions of Gdansk, Gdynia and Sopot. We really enjoyed this well kept house with its lots if space, garden and quiet ambience. You can reach main roads within minutes, so perfect as hub to start sightseeing tours to Gdansk or spend a day at Zopot Beach. WE HAD A WONDERFUL TIME. A WARM WELCOME ON ARRIVAL. WE WOULD LOVE TO RETURN NEXT YEAR AND PLANNING HAS ALREADY STARTED. A LOVELY COLLECTION OF HAPPY MEMORIES! THANKS......TOM, MARGOT, JEFF & CHRISTINE........FROM THE COUNTRY BY THE NAME OF YORKSHIRE! House of Storks met all our expectations. The house is fully equipped with all you need in a holiday home. It offers a lot of space inside and out and is situated in a lovely neighbourhood. It wasn't difficult to find, as our (British) satnav knew even the smallest dirt track in Poland. The owner provided a survival pack of food for the first supper and first breakfast, plus soap, dishwasher tabs and toilet paper to start. The house and garden are well kept. We enjoyed our stay here. We enjoyed so much our stay at The House of Storks. We are a family with four children and we all had a wonderful time. The backyard and house are lovely! There was enough room and space for our family. The house is very well decorated. There are also a lot of things to visit in the area. Sopot, Gdansk and the castle of Malbork are amazing and are very near the house. The house is isolated from the mainroads and is in a very nice neighbourhood. The owners are first class! We just met our first and last day but did not meet during our stay although they live next door. We had a lot of privacy thanks to this and that was what we were looking for. I would highly recommend this house for any family who wants to have a fantastic place to stay for nice vacations in Poland. Please note that an additional charge will be made for gas and electricity used.